What's this bifurcating succulent found in a greenhouse in the Gobi Desert? I was invited to a lunch yesterday in the countryside. It turned out to be lunch in a greenhouse full of cacti and succulents. There were some I didn't recognise, and the only tags they had on them were prices. This one is about 8 cm (3 in) left to right. Location: Gobi desert. 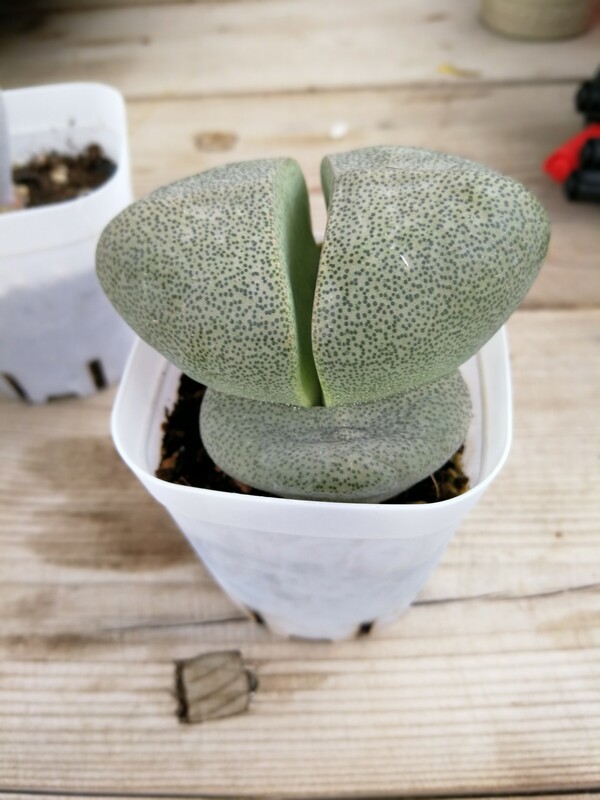 That is called Pleiospilos nelii. It's a succulent, and a member of the same family as Lithops (Aizoaceae), but it's not a Lithop. It is a leaf window plant, like Lithops. They make a yellow-orange daisy-like flower in the early spring. Definitely from S. Africa, not Asia. The dots are windows that let sunlight in to the interior of the plant. Fairly common, but kind of cool looking IMO. There's a genus called lithops that looks like that but they're native to South Africa. I've heard these called "Living Stones" or Stone plants. That's apparently one of the common names while the Lithops is the more formal name. They are an "ice plant". Very cool plants, for sure. Not the answer you're looking for? Browse other questions tagged identification succulents or ask your own question. What's the best thing to do for a neglected agave? What is this cactus with flat pads and spines growing in small patches? What is this flowering succulent? What's this black spot on my gasteraloe? What is this succulent with a tall flower spike with green pods in the UK? Big cactus identification and how long does it take?